Did you know that Superman plays chess? Well he does. Not only that, he appeared ‌as a chess piece 70 years ago. You know who also plays chess? Batman. He was spotted, even earlier, playing the joker as Robin looked on in 1944. In fact the entire Justice League of America enjoys planning sessions around a chessboard. Who knew? Apparently the history of chess in comics is so rich you can fill a museum exhibition and that's precisely what the World Chess Hall of Fame in Saint Louis, USA, have now done. A new family-oriented show opening March 23rd, "POW! Capturing Superheroes, Chess & Comics" brings together everything from Golden Age cover art, to rare chess sets, and even Magnus Carlsen. The idea originated after the success of the Kings, Queens & Castles exhibition which opened in late 2015, says Chief Curator Shannon Bailey, and after it closed they began looking for another theme to attract kids and families in particular to the museum. "I think a show like this is going to appeal to little boys and little girls — there's Wonder Woman in it, and there's fun toys and there's super hero girls." We get asked a lot, 'who is your target audience' and we say 'everybody', and people say 'it can't be everybody' but it really is. This year commemorates the fifth anniversary of the WCHOF, which hosted some 60,000 visitors since its opening across the street from the Chess Club and Scholastic Center of Saint Louis, and was the first major expansion of what is now known as the "Chess Campus" in the Central West End neighborhood. The exhibit will include many rare and obscure comics, dating as far back as 1942, including the Justice League of America number one edition from November 1960, which featured all of the main characters on the cover playing chess. Chess and comics are a natural pair, Bailey says. "That whole idea of the battle or struggle of good and evil, strategy, speed — these artists really took well to understanding the game, and it's just great to see chess so much in popular culture". Much of the collection is on loan from Bernice and Floyd Sarisohn who have also donated objects to the original US Chess Hall of Fame museum in Miami, which are now part of the permanent collection. "They collect everything related to chess. Chess sets, chess clothing, salt and pepper shakers. You name it — if it's got chess on it, they collect it", Bailey notes. The exhibit will also display 18 unique rare limited edition chess sets acquired by the museum. Other sets — featuring popular characters like Spiderman and Batman — will be set up for visitors to actually play on during a visit to the Hall. 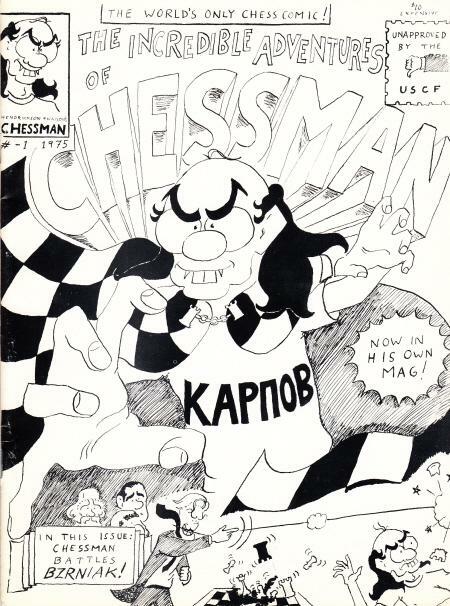 Chess even once had its own superhero: "Chessman"! There are only two editions of the "Incredible Adventures of Chessman" by IM John Watson, both of which will be on display. The first, from 1975, bears the notice in the upper right corner "unapproved by the USCF." Presumably the U.S. Chess Federation will have changed its tune 40 years later. There is also an entire series of comic books called "Checkmate" dedicated to a fictional organization known as the Agency, whose structure was modeled on chess. The series ran for a total of 64 issues (coincidence?!) between 1988 and 2008. 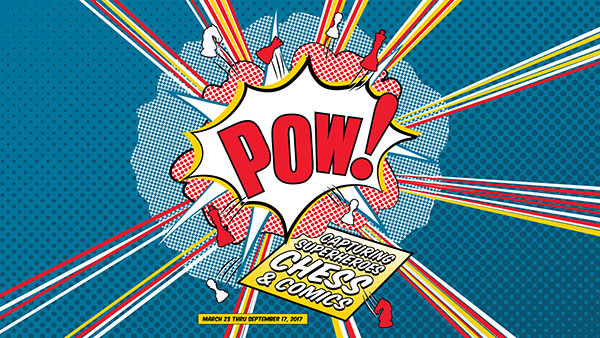 The WCHOF hopes to attract new visitors to the museum who are fans of comics but not necessarily chess, and to that end the exhibit is timed to overlap with Saint Louis Comic Con in mid-June. Bailey says the WCHOF now plans to host exhibits aimed at children and families about every other year, as the staff and supporters missed having the Hall filled with young voices. This exhibit is just the start. "It makes me want to be a kid again. I missed out on the comic book craze as a child but I get to relive it now in my forties."